Description Of Item: Where do you send your pets when they're ready for some fun in the sun? Let them relax and play at the beach! 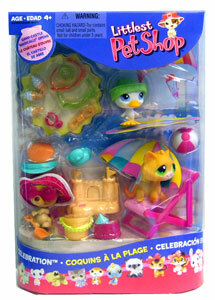 This playset comes with three sweet pets and 20 accessories for a pretend-filled day of sun, sand and sea! Includes dog, cat and ducky figures, 3 pairs of sunglasses, 3 ice cream cones, 2 collars, rope toy, flying disc, 2 beach hats, visor, beach ball, sand bucket, shovel, water dish, floating toy, beach chair and sandcastle.